We tend to think of the Civil War as a uniquely American event; a war waged within our borders that defined the fate of the country. We rarely think of it as an international war, but the Union and the Confederacy knew that their fates were closely tied to whether Britain, France, and Spain would take a stand in the conflict and, if so, which side they would support. These nations—and, indeed, the rest of the world—cared deeply about what the Civil War meant and were profoundly affected by its outcome. If Europe had intervened in the US Civil War by recognizing the autonomy of the Confederacy it would have changed history. And that came perilously close to happening. Britain, France, and Spain all had their reasons—economic as well as political—to want to see the Confederacy prevail. Napoleon III went so far as to move into Mexico, awaiting the opportunity to reclaim territory for France. But much of the popular opinion in Europe sided with the Northern cause, and the Union made every effort to take advantage of those sympathies to gather much-needed support. Both sides sent envoys to Europe, hoping to convince the great powers that their cause was the most worthy. The race to earn foreign support is one of the great stories of the war – yet one that is little mentioned and too often forgotten. In many ways, the outcome of the war hinged on the answer to a question posed, on behalf of the citizenry of Europe, by Giuseppe Garibaldi, the charismatic Italian revolutionary. His question, “what was America fighting for?” would be asked by others—journalists, intellectuals, politicians—all of whom wondered if the war was about something universal, or if it was a provincial battle over tariffs and taxes. If it were to be a cause of all nations, the war would have to be fought over something that mattered. 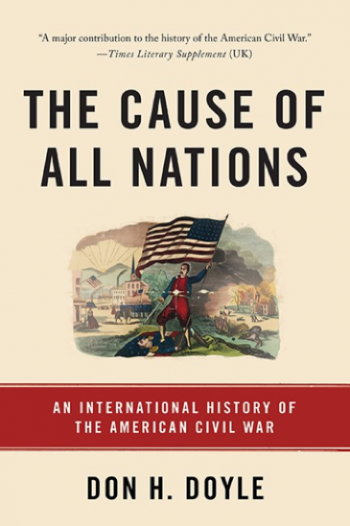 In The Cause of All Nations, Don H. Doyle tells the story of how both the Union and the South struggled to define the war in terms that would engage the rest of the world. They knew that far more than material support was at stake. As Lincoln struggled with the answer to Garibaldi’s question, her realized the moral imperative to step forward and embrace the cause of emancipation. As he did so the foreign press and popular opinion turned toward the Union cause and the attempts to gain recognition for the South were derailed. Having found a voice for making the Union cause a universal human cause, Lincoln’s reputation soared. Military successes would follow, and the triumph of the Union soon led to advances in the cause for emancipation across the globe. An eloquent, eye-opening look at American Civil War, The Cause of All Nations puts a familiar story in a broad and revealing new context. Don Doyle…vividly demonstrates that, far from being a “‘brother’s war’ fought by Americans over uniquely American issues,’” the Civil War was an earthshaking event that threatened and engaged the governments and people of Europe from the British Midlands to Rome. An important—even necessary—addition to the groaning shelves of Civil War volumes. “An enlightening and compellingly written book…. More than any previous study, it tells the story of how America’s civil war was perceived, debated and reacted to abroad, and how that reaction shaped the course of the war at home. Doyle’s important book reveals why the war was more than a domestic quarrel; it was also a geopolitical event that shook the global balance of power. A lively and entertaining new history…. For Civil War buffs, reading the book is like arriving at your favorite restaurant from the street you never take; you know exactly where you are, but nothing looks quite the same from this angle…[Doyle] similarly succeeds in telling a story that is both familiar and wholly original. Well researched, evenly balanced…. Doyle’s greatest asset, as both a historian and writer, is his ability to patiently tell this story with color, verve, and flair: while also weighing in with his own expertise and commentary at crucial periods of the narrative. A major contribution to the history of the American Civil War…A timely reminder of the benefits of looking outwards, to Europe and the world at large. [A] tour de force [that] stunningly reconceives the American Civil War. Doyle has written the definitive transnational account of the American Civil War and at the same time has given much food for thought to both American historians and historians of nineteenth-century Europe on a myriad of possibilities for further exploration of the connections and comparisons between the 1860s Old and New Worlds that he has highlighted in his book.